There are a number of terms used to describe parts of a modern Vespa that aren't readily apparent to everyone. Here's a glossary of terms. Note that some of these are real and "official" names, and some of these are terms that have come into being through discussion here at Modern Vespa, and are not widely accepted outside of this forum. The process of needless additions to a topic for the purpose of keeping it high in the forum listing. Derogatory for someone driving a car, truck or other 4-wheeled vehicle. Refers to steering wobble. Some Vespa models (such as the GTS at about 30MPH) are well known to have varying amounts of handlebar wobble that usually show up at some range of speed and then (typically) go away. FAQ: Is it normal for a GT/GTS to "wobble"? Each Modern Vespa account logs how many posts you have made. Each member is assigned a rank name based on the number of posts. New members have a rank name of "Lurker". Just participate and post, you'll automatically get promoted as your post count grows. FAQ: Why Am I Listed as a Lurker? FAQ: What Are All The Ranks And How Many Posts Do I Need? A recently resurrected very old discussion. This is sometimes due to an newbie doing a search and not realizing they've stumbled upon an old thread, innocently make a posting. Sometimes it is because an old thread is timeless or there is new related information. And then there's the times it is done to annoy all of us! This refers to the underseat storage compartment found on all modern Vespas. As the storage compartment is right above the engine, it tends to get fairly warm. 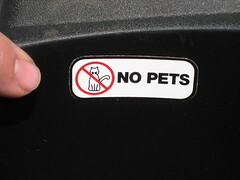 On US-spec Vespa models, there's also a sticker that says "No Pets" affixed to the side of the storage compartment, leading to speculation as to why Vespa would feel it necessary to put that sticker there for the US audience. Common institutional shorthand for a motorcycle. Used to describe a contrarian newbie (aka Lurker). Please know what you are talking about before you trash something. Overstep and you may get branded a troll. A component of the CVT (Continuously Variable Transmission) that does the actual changing of "gear" ratios. It uses weighted rollers that move outwards relative to the driven shaft as a function of the rotational velocity. This outwards movement changes the effective diameter of the driven sheave for the drive belt which has the effect of changing the "gear" ratio of the drive belt system. In the Vespa CVT system, the two primary wear components are these weighted rollers and the drive belt. In the Vespa world, this generally refers to the weights that are used in the variator to determine its response to engine RPM.